Businesses are undergoing a digital revolution. The exponential growth of technology such as mobile payment systems, machine learning, satellite imagery and other innovations is transforming systems and processes and generating valuable information used to make better decisions. The challenge is bringing this technology into sustainable supply chain management, particularly the sourcing of the commodities we consume every day such as tea, coffee and cocoa. Daan de Vries, Chief Innovation & Technology at Rainforest Alliance, answers the question: How can digitization be put to best use by companies wanting to tackle critical issues in their supply chains such as climate change, deforestation, ecosystem degradation and rural poverty? I see three important shifts that are enabling practitioners to harness the power of data to better manage sustainable supply chains. Firstly, as sustainability becomes integrated into business practices, companies are demanding improved measurement of performance and return on investment through deeper insights into their supply chains. Digitization provides companies with the opportunity to build stakeholder trust by increasing the transparency of how they do business as well as enhancing their broader sustainability strategies. For example, various companies committed to the CocoaAction sustainability strategy that brings together the world’s leading cocoa and chocolate companies, collaborate with the Rainforest Alliance to collect digital data on the adoption of good agricultural practices by cocoa farms. The insights from the data help companies and farmer groups take informed decisions about where to invest their time and money to have the best impact. Secondly, many companies are turning to certified sourcing as a critical element of their sustainable supply chain initiatives, since certification offers a level of transparency and stakeholder involvement that few other systems do. Farmers and companies that are investing in certification are already managing a large amount of data, but most of the field data is still coming from paper-based systems. Many systems were started over a decade ago and are now rapidly changing as a result of much higher digital connectivity, literacy and affordability. 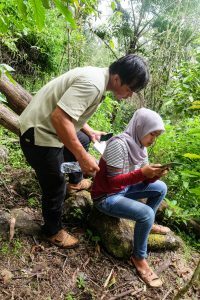 Several Rainforest Alliance projects enable farmers to collect data so that they can better and more efficiently assess how they perform with regard to our sustainability standards and where much-needed improvements can be made. Performance data from the field are available immediately on a dashboard, enabling farmers to act quickly. On top of efficiency benefits, further advanced analysis of data from within farmer groups combined with other 3rd party data sources can benefit farmers, auditors, and companies. 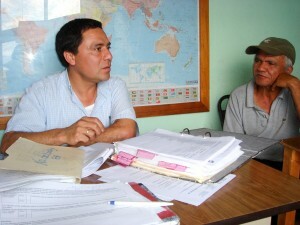 For instance, the Rainforest Alliance has been analyzing digital data from partners in the field, with pilot projects in the UTZ cocoa and hazelnuts programs. Thirdly, with digitization becoming a cornerstone of agriculture in large-scale operations through practices such as precision-farming using soil sensors, automated irrigation, and aerial surveillance, it is important to remember that smallholder farmers may need an alternative technology mix. Data collection and analysis can help identify and understand the bigger issues behind unsustainable practices, develop more targeted and tailored plans on how to address them and then monitor and measure progress and impact. For farmers to collect data, it is imperative that they see these benefits. 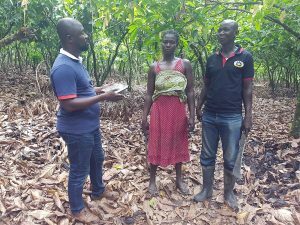 Field coordinator Isaac Addo with workers Joseph Kwaku Boakye and Jennifer Hunkple in the SAT4Farming program. Together with Grameen Foundation, Mars and other partners, the Rainforest Alliance has recently launched the SAT4Farming program, an initiative to reach thousands of small-scale cocoa producers with information and services that will allow them to improve their productivity and sustainability. It is designed to use digital technology and satellite imagery to create individual farm development plans that guide Ghanaian cocoa farmers over a seven-year period. Another example is the collaboration between the Rainforest Alliance and Nestlé to monitor and evaluate the sustainability risk and performance of Nescafé Plan coffee farmers across ten countries. Within this project, the data on a key set of metrics are collected using mobile solutions that eliminate the need to manually input data and conduct time-intensive data quality control. More recently, this partnership also adopted data visualization tools to ensure the translation from data to insights and decisions. Only time will tell to what extent the digital partnerships highlighted will drive large-scale transparency and sustainability in commodity supply chains and create a positive impact for all farmers: this journey is not without its obstacles. For instance, sharing data and connecting sets of data is much more than just a technical challenge – there are social, commercial and legal aspects that need to be addressed. To overcome the obstacles, all stakeholders, including sustainability standards, NGOs, companies, and governments, must join forces to scale up digitization in the field and enable farmers – and our environment – to benefit from it on a larger scale. You can follow Daan de Vries on LinkedIn. This blog is based on an article published August 30, 2018 on businessgreen.com. Why does UTZ only work on coffee, tea, cocoa and hazelnut?